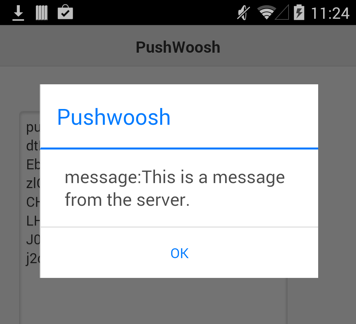 The Pushwoosh API lets you send notifications from your computer to your app running on the device. While your app is running, if a notification is received, a function in your app will be called with the contents of the notification. It can then take whatever action needed based on the incoming data. 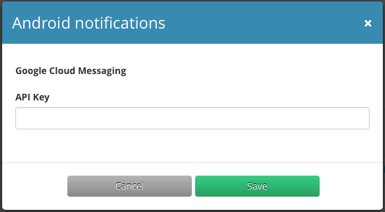 Notifications are a way to send and receive messages from your device. They have the ability to be broadcast to large numbers of devices. For Android, Google Cloud Messaging is used. For iOS, it uses the Apple Push Notification Service. Let's send a simple message to a device. We're assuming everything is set up already. We will cover how to set things up later. 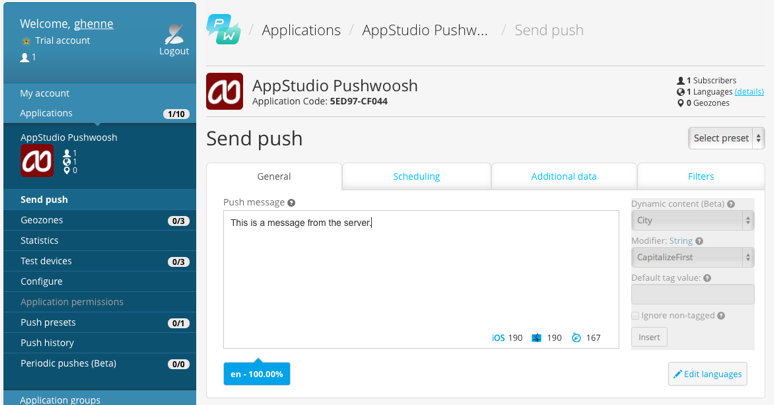 In Pushwoosh, we can compose and send a notification to our app. There are other ways to send notifications: this is the easiest. Set Title to the name of your app. Under Android SDK, select Appresser to set the format of the data being sent. The end result will be to get an API Key, a number which looks like 938103699235. This will be used later as your projected in your AppStudio program. The appid appears on the list of applications. You'll need this number for your AppStudio program. Now that everything is set up on the sending side, let's create an Android app which can receive notifications. To do this, we need to use the Pushwoosh PhoneGap Plugin. You can see this app in Samples folder 7. You will need AppStudio 4.1.3 or higher to run this sample. To include this in your project, you need to do two things. MsgBox "This sample only runs as a native app." When the app is completely loaded, call initPushwoosh. When a notification comes in, call notificationReceieved. Here is where we fill in the projectid and appid that we got from setting up Pushwoosh. We also have subroutines which get called if the initialization succeeds or fails. If the notification succeeds, we get a status message back with the push token. This will only work if the app is running in the foreground. If it is in the background, the MsgBox won't show. The rest is the same as any PhoneGap app. 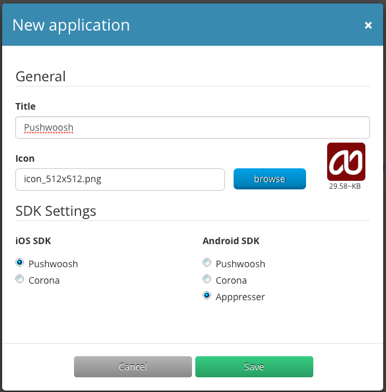 Use the "Build Native App using PhoneGap" option on the Run menu to upload your project. Download it from the "Get Native Build Status" screen. The push token should appear right away. Apps can send notifications as well, up to 10 megs in size. This sample is for Android. iOS has a different authentication scheme: the main difference is in the initPushwoosh() function. This page was last edited on 15 May 2017, at 12:55.